Here are the amazing results of a study on Colipex conducted by Dott. Andrea E. Scaramuzza , Diabetolog?ist of the Diabetologia Pediatrica, Università di Milano, Ospedale Luigi Sacco, Milano, Italy. ?The study has been presented in September 2015 at the EASD congress: Elastargene 3C helps to improve glycated haemoglobin in children and adolescents with type using insulin pump therapy. Lipodystrophies are abnormalities of fatty tissues caused by the lipogenic effect of insulin. The insulin-induced lipodystrophies represent the most commonly reported cutaneous complication of insulin therapy for the diabetics. This complication has a strong negative impact on diabetics mind because of the unsightly aspect of lipodystrophies as well as a negative impact on the blood glucose management because of increased insulin requirements. 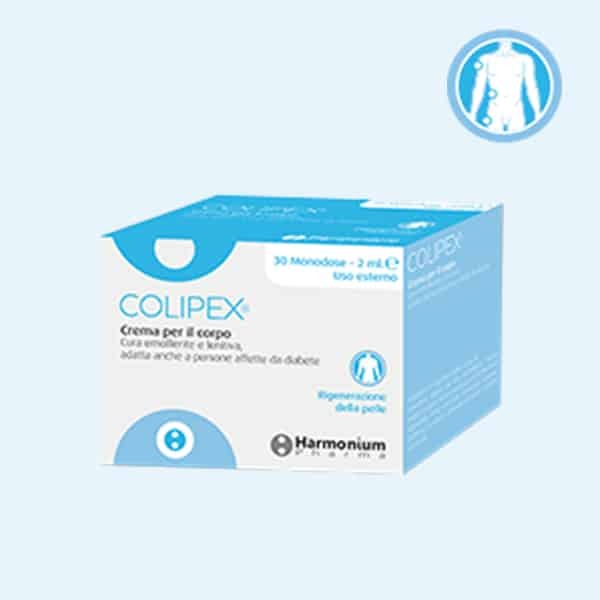 Thanks to its composition, Colipex has an emollient and soothing effect improving the skin elasticity. It also has a moisturizing and nourishing effect on the skin. Apply the cream once or twice daily, in the morning and/or evening, thanks to a smooth massage on the altered areas that day. Skin-related complications of insulin therapy: epidemiology and emerging management strategies. – Richardson T1, Kerr D. Am J Clin Dermatol. 2003;4(10):661-7. Treatment of human skin with an extract of Fucus vesiculosus changes its thickness and mechanical properties. – Fujimura T1, Tsukahara K, Moriwaki S, Kitahara T, Sano T, Takema Y. J Cosmet Sci. 2002 Jan-Feb;53(1):1-9. Anti-inflammatory activity of hamamelis distillate applied topically to the skin. Influence of vehicle and dose. – Korting HC1, Schäfer-Korting M, Hart H, Laux P, Schmid M. Eur J Clin Pharmacol. 1993;44(4):315-8. High molecular compounds (polysaccharides and proanthocyanidins) from Hamamelis virginiana bark: influence on human skin keratinocyte proliferation and differentiation and influence on irritated skin. – Deters A1, Dauer A, Schnetz E, Fartasch M, Hensel A., Phytochemistry. 2001 Nov;58(6):949-58. In Vivo skin hydration and anti-erythema effects of Aloe vera, Aloe ferox and Aloe marlothii gel materials after single and multiple applications. – Fox LT1, du Plessis J1, Gerber M1, van Zyl S2, Boneschans B2, Hamman JH1., Pharmacogn Mag. 2014 Apr;10(Suppl 2):S392-403.